Have you ever admired beautiful (but a bit expensive) earrings, necklaces, pendants and rings with multi-coloured crystals which brilliance is comparable to that of a diamond? If yes you are undoubtedly familiar with the brand name of Swarovski and you recognize that characteristic swan logo. The company manufactures crystal jewelry stones, crystal gifts and objects–including its famed collection of miniature animals–and accessories, as well as crystal-based materials for the fashion industry, and components for crystal chandeliers. Swarovski is also well-known for its Swarovski Optik subsidiary’s line of high-performance telescopes, gun-sites, and binoculars for hunters and birdwatching enthusiasts. It all started in 1895 when Daniel Swarovski established his crystal cutting company. As a young man Daniel apprenticed within his father’s own Bohemian glass foundry. Bohemia at that time was renowned throughout Europe and America for its particular style of crystal glass making; crystal objects, produced there were perhaps not of the best quality but definitely cheaper than those from the famous Italian Murano island near Venice. Daniel Swarovski came up with the idea of cutting glass with an electric powered tool and improving its quality. By 1892 he had produced a workable prototype machine and decided to patent his invention. So effective was this machine in cutting and creating precision and multifaceted crystal glass, that he proceeded to set up his own company with some other financiers, Franz Weis and Armand Kosman. Now let me explain shortly what crystal glass really consists of and why it is different than normal glass. Technically, the term crystal is not applied to glass, as glass, by definition, lacks a crystalline structure. The use of the term lead crystal remains popular for historical and commercial reasons, and originally stems from the Venetian use of the word cristallo to describe the rock crystal imitated by Murano glassmakers. Lead oxide added to the molten glass gives lead crystal a much higher index of refraction than normal glass, and consequently much greater “sparkle”. Ordinary glass has a refractive index of n = 1.5; the addition of lead produces an index of refraction of up to 1.7. To put is shortly lead glass, although not exactly good for your health, is desirable owing to its decorative properties. For centuries, if you wanted to produce glass you had to have a lot of wood close at hand. Wood meant cheap energy. That’s why it had long been the habit for Bohemian glass foundries to be somewhat nomadic, needing to uproot their complete factory, with workers and families, and move to new forest lands, which would provide fuel for their furnaces for another decade or more. So, and after careful consideration, it was not too surprising that Swarovski and his new partners, Kosman and Franz Weis, decided to set up the new company in a new country far away from glass manufacturing competitors. Wattens in the Austrian Alps, not far from Innsbruck, was the chosen site. The choice was based on the fact that there was the recently created hydro-electricity plant within the vicinity, which provided cheap electrical energy without the need of clearing a forest. Swarovski’s invention produced crystal gemstones of outstanding quality–and the patented process enabled the company to become the world’s leading producer of crystals. 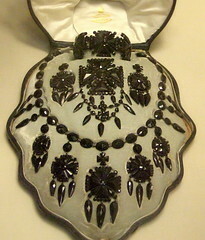 In the late 19th Century, crystal was regularly used to enhance formal evening wear. Crystal pieces were actually sewn into formal jackets and gowns. Swarovski took advantage of this fashion trend and in 1913, he created his own crystals exclusively for the fashion industry. Always the entrepreneur, Swarovski used the shortage of cutting machines and materials during World War I to enhance his business. For the war effort, Swarovski produced grinding and dressing tools that were used to process crystal stones and he marketed them under the name of Tyrolit from 1917 to 1919. Until about 1956, Swarovski would often use the innovations of his original crystal company by developing subsidiary companies which provided products for automotive and roadway reflectors, telescopes, and lenses. The 1930s saw several significant developments. The first of these was a line of crystal ‘trimmings,’ which debuted in 1931. 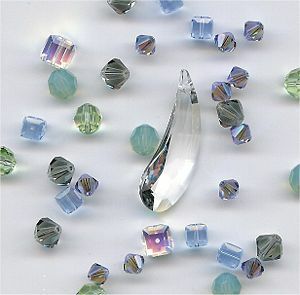 The Swarovski trimmings featured the company’s crystal gemstones prepared in a variety of ready-to-use formats for edging, hems, and borders. Also known as rhinestones, Swarovski’s gemstones were of such high quality that they were often mistaken for real diamonds. In the 1930s, also, Wilhelm Swarovski, one of three sons of Daniel Swarovski, began work on a prototype for a pair of field binoculars. Apparently he had inherited his father’s inventiveness, had joined the family company at the age of 17, and had long been conducting experiments in glass smelting techniques. Wilhelm Swarovski finished his prototype field glasses in 1935, developing new grinding techniques for the field glasses’ hand-ground and polished optical components. The company’s field glasses were to remain in the prototype stage, however, until after the war ended. Though the Great Depression of the early 1930s, and then also the Second World War reduced the demand for Swarovski glass, they were not altogether forgotten. However it took a new generation and the Aurora Borealis designs in the mid-1950s to reaffirm their reputation and innovation. This line of jewellery was the creation of the grandson, Manfred Swarovski, and possessed a dreamlike sparkle of rainbow colors created by a trace metal coating. The process was brought to perfection with input from Christian Dior, the famous French fashion designer. The first crystal collectible sold by Swarovski was a mouse figurine. The mouse, a best seller at the Innsbruck Olympic Games, enjoyed prominence throughout the world. In the early 1990s, exhibitions featured Swarovski crystal and its crystal technology. In 1995, the company celebrated its 100th anniversary with the production of a prominent Swarovski century swan in silver crystal. In that same year, the firm opened its exhibition center featuring a history of crystal and the Swarovski company. It is really worth visiting if you ever go to Austria. Crystallized™ – Swarovski Elements is the new brand for the company’s core products ~ loose, flawlessly cut crystal components. I decided to organize my first giveaway on this blog! In my free time I amuse myself with creating jewellery and I have designed for you all a pair of pierced earrings with one Swarovski pearl and one Swarovski bicone crystal each. As the spring is coming the pearl is daffodil-coloured and the colour of the crystal is described as “golden shadow” (on your monitor colours might look a bit different than in reality). They are ca. 4 cm (1.6 in) long – perfect for any occasion! The photo of the earrings can be found on the black hole page, linked here. You can win the earrings as long as you leave a comment below. In the comment you must include your contact e-mail address. One more thing – you should be among the followers of this blog. As simple as that. The giveaway will be open for 13 days (so from 15 February to 1 March) and then the happy winner will be announced. This entry was posted in giveaway, miscellaneous essays. Bookmark the permalink. I saw them on the black hole! They are way cute. I am entering! You don't really need me to post my email addy here do you? 🙂 I think I was your first follower.I used to buy glass animals from a fellow on Yonge St.. They were inexpensive and nicely made. Doesn't everyone start a collection once they have seen Tennesee Williams' A Glass Menagerie? OOH!! I'm entering. I knot you have my contact info. Yes, I follow. No problem ladies – thanks for entering and I do have your e-mails; I wish you luck! 🙂 I am very glad, thanks and good luck! No problem Demitria – if you win I will contact you on your blog. Good luck! Hi Judy – you are in and thanks for following! Good luck!